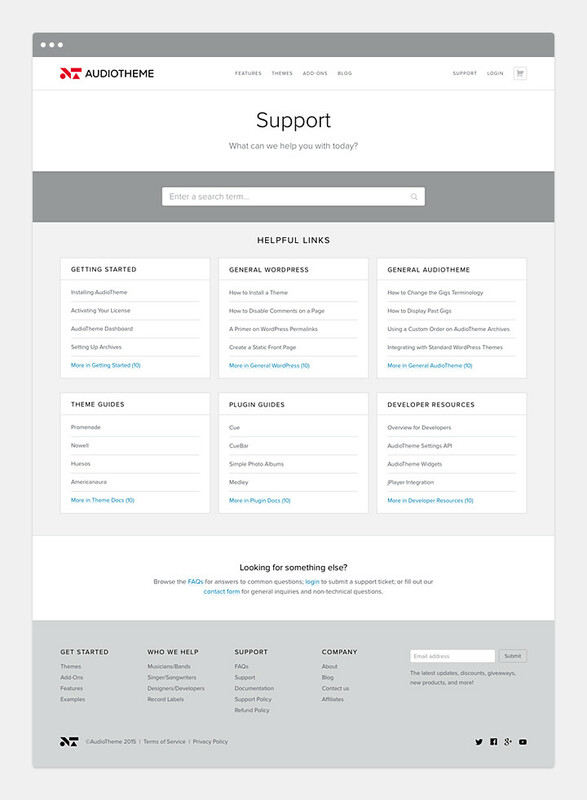 If you’ve visited AudioTheme within the past couple of weeks you probably noticed we got a fresh coat of paint. If you’re new here, you might be wondering, “What exactly is AudioTheme?” That’s a good a question. On one hand, it’s our company name. 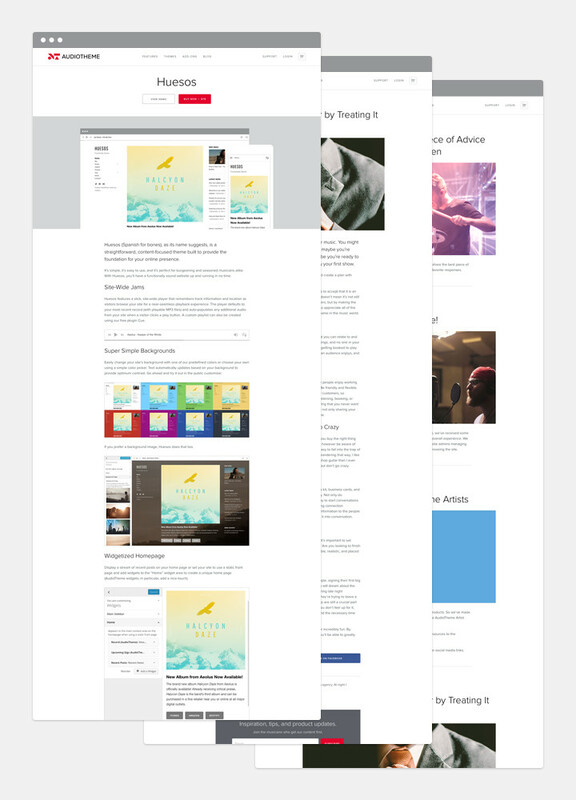 We sell audio-centric WordPress themes for people who make music (musicians, songwriters, bands, etc.). 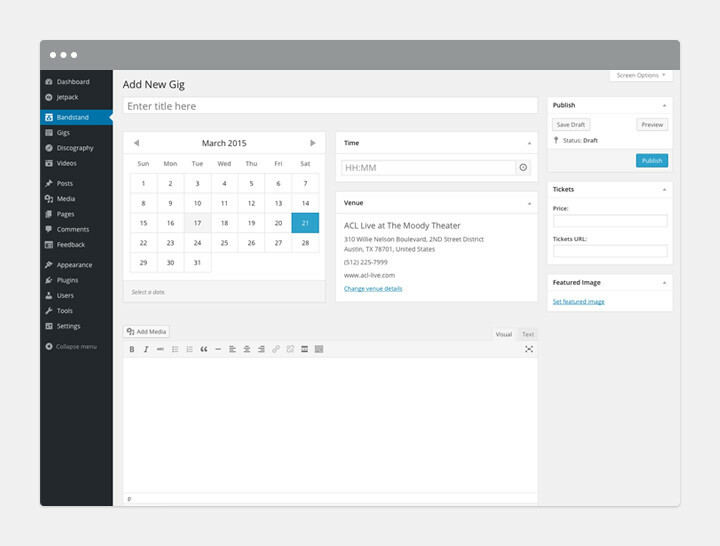 Our themes include functionality to manage discographies, gigs, venues, and video libraries. Powering all of those features, to make them portable from one theme to another, is a plugin we built — also called AudioTheme. Confused yet? You’re not alone. From time to time, our products and company have been written about or mentioned in podcasts, and it’s painfully obvious we haven’t done a good job differentiating the company and the plugin, or that AudioTheme is more than just a single theme with audio functionality. To help remedy some of that confusion, we recently rolled out the first part of a rebranding process, which includes a new identity and website. The second part will involve upgrading and renaming the plugin to ease confusion. When that happens, AudioTheme will refer to the company only. The plugin upgrade is still a ways off, but streamlining the process of adding gigs, venues, records, and videos is our top priority. 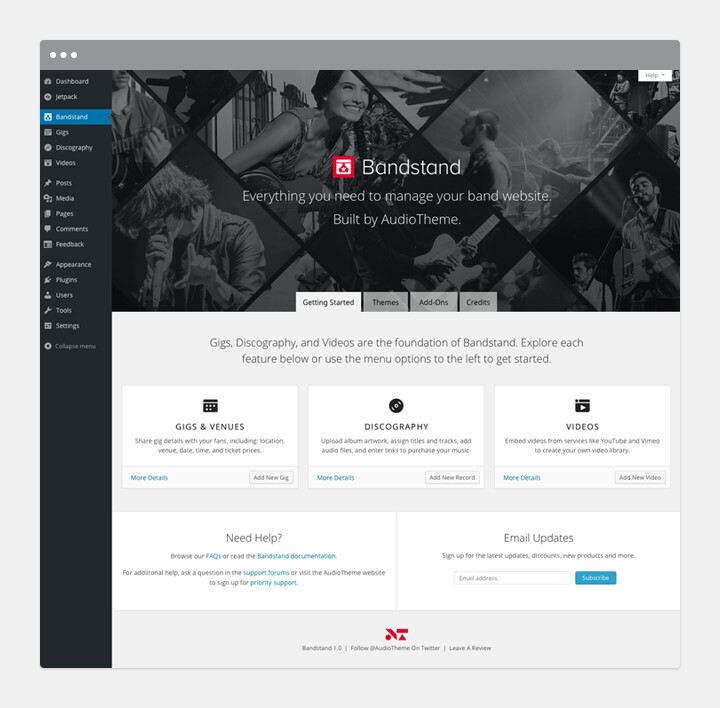 We want to make it as easy as possible for musicians to update and maintain their website. Bandstand was our first choice for a new name, but due to a conflict we’re back at the drawing board. We’re also throwing around the idea of releasing the plugin for free in the plugin directory, so let us know if you have any feedback on that or ideas for a name. We’re all ears. In the meantime, I wanted to share some of the stuff we’ve been working on this year. The references to Bandstand are a working title only, but it should give you an idea of how everything will fit together. 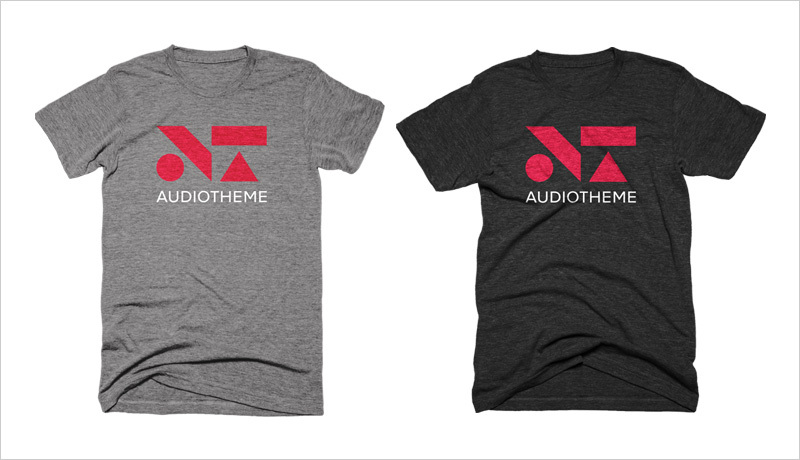 Each plugin released under the AudioTheme brand will consist of a custom Dashicon-style icon for the logo. This will allow us to maintain consistency with the WordPress admin when the plugin needs to be present in the menu and create convenient branding assets to use everywhere else (on our website, for example, or the WordPress plugin directory). 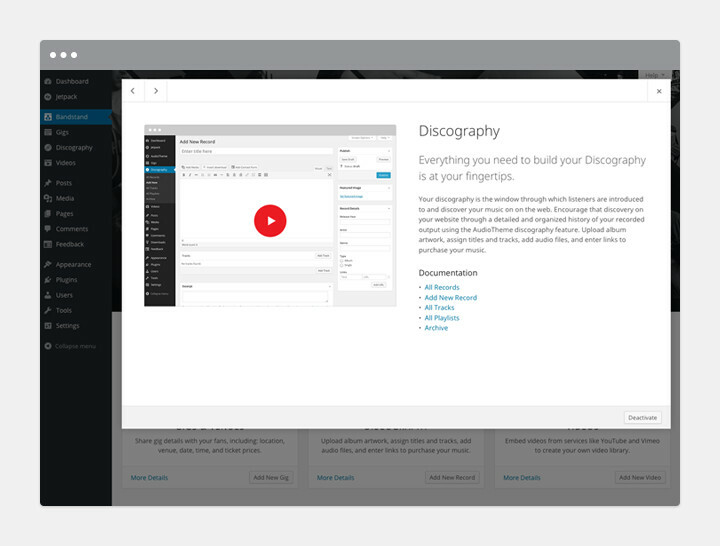 Introduction to the discography feature in Bandstand. Add a new gig screen in Bandstand. A potential technique for extending our logo featuring some of the people who have trusted AudioTheme. 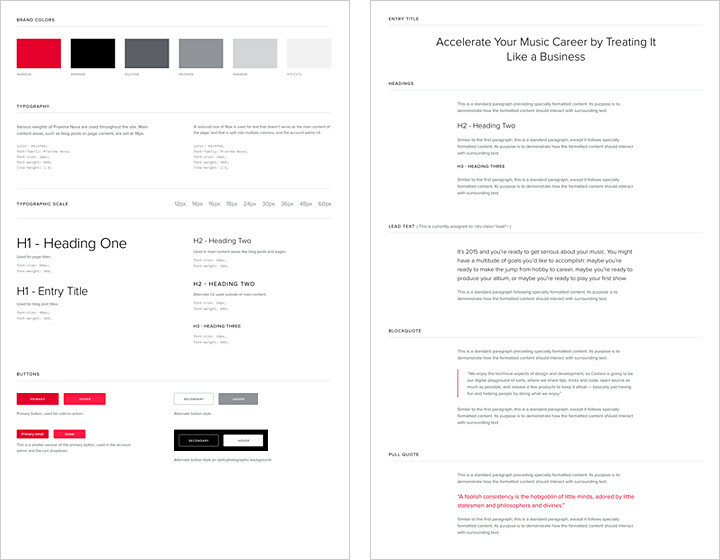 In all of my mockups, I’ve been using the tagline, “Websites for people who make music.” That may not be our main messaging going forward, but I like that it puts an emphasis on people — they’re the most important aspect of everything we do. 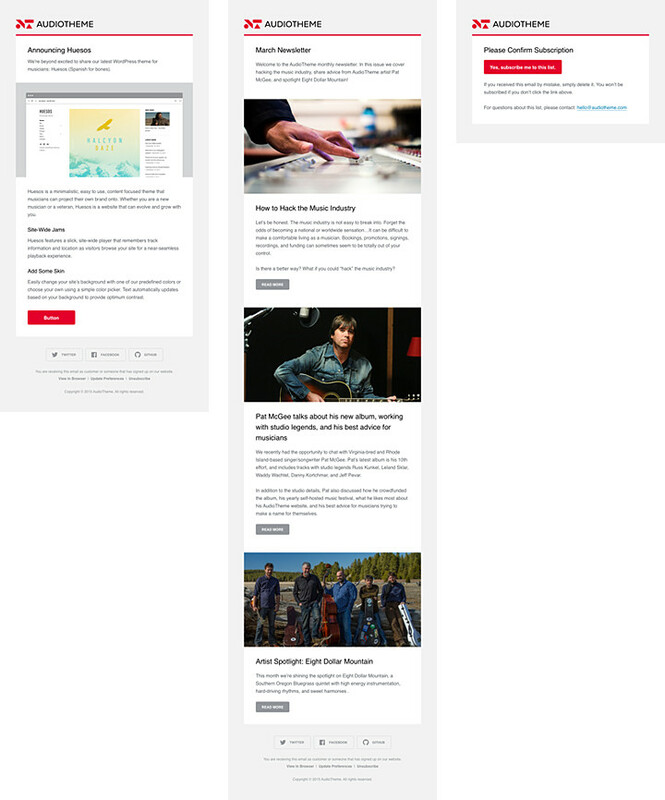 On our new homepage, you’ll notice we reinforce this belief by highlighting several musicians in a slideshow at the top of the page and again with the Artist Spotlight section at the bottom of the page. 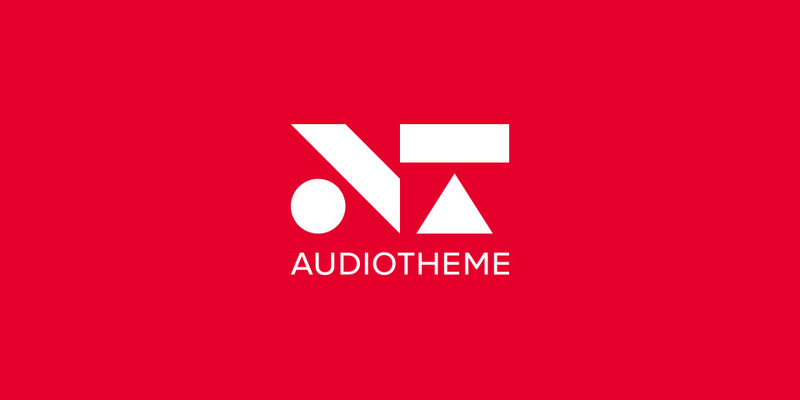 If you’ve supported AudioTheme so far, we can’t thank you enough. The only thing left to do now is plaster our new logo all over some t-shirts, because if one thing holds true, you’re not a legit WordPress compay until you have t-shirts. Brody is a designer, avid patron of country and roots music, and former editor of The 9513, a popular online country music publication where he championed independent artists alongside major acts. It’s that desire to even the playing field and his experience in the daily research and discovery of talented artists that inspires his vision for AudioTheme.